Ipca Laboratories Ltd.is a fully integrated Indian Pharmaceutical company manufacturing and supplying over 350 formulations and 80 APIs for various therapeutic segments. WITS Interactive, the entity that provides Brand Communication Solutions, which create effective brand engagements, proudly took up the responsibility of branding Ipca across 360° media platforms. Ipca is a brand that is continuously evolving with each passing day and so is their brand identity. This essence of the organization had to be reflected through their website. A modern and approachable feel along with user experience being as candid and logical as possible, was our motive behind creating their website. The client wished to create an engaging website that matched its re-branded look. This included updated images to visually support the content. Elements like creative product list and financial highlights were depicted using Infographics. The site seamlessly integrated animated elements with the colour of their logo. The company logo was linked to the home-page to avoid user confusion. The website navigation was made simple and clutter free. Ipca's website was created with a theme in mind, i.e. modern, dynamic yet warm and friendly. WITS Interactive provided the client with a quality website which not only generates traffic but also helps in increasing their sales. 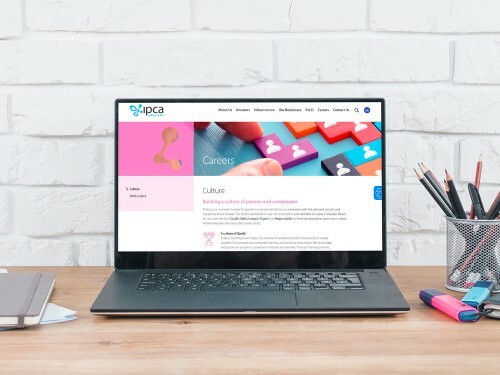 WITS Interactive team worked on online management for Ipca making sure their website appears in front of their customers when they wish to view on search engines. With on page optimization, which includes Meta tag optimization, h1 optimization, URL structure design, image tag optimization, we made sure the factors had a direct effect on the website and web page listing in natural search results. Also, with off page optimization, we made use of Directory Submission and 1 way link building in order to make sure that it also covers activities happening elsewhere. We have been handling the Facebook page of Ipca, making it active and informative enough for their fans.